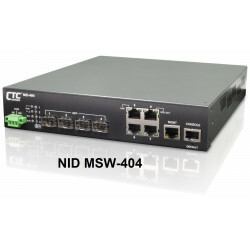 The MSW-404S is the new generation of carrier grade Ethernet demarcation device for business connection and mobile backhaul transportation service delivered by carriers. 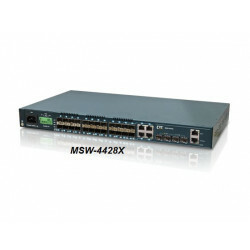 The MSW-404S is equipped 4 SFP slots as dual rate 100/1000Base-X and 4 ports 10/100/1000Base-T RJ45 network interfaces. 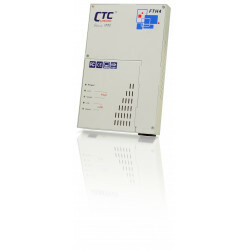 It is designed to enable E-Line, E-LAN, E-Tree services which are CE (Carrier Ethernet) 2.0 compliant for Metro Ethernet network deployments.The MSW-404S device enables carriers and service providers to delivered SLA-based network service with extensive fault detection and diagnostic capabilities which are compliant with the latest Ethernet OAM standards such as IEEE 802.3ah, IEEE 802.1ag and ITU-T Y.1731. With built-in RFC2544 and ITU-T Y.1564 feature sets, The MSW-404S also enables the service providers to perform the SLA verification anytime to ensure the quantitative latency, jitter and throughput delivery performance indexes. The CE2.0 compliant functions support EVCs and 3 colors marker QoS traffic management to enable service providers managing bandwidth and enforce SLA guaranteed. This card may be controlled and monitored via an NMC in a managed chassis or used as a completely manageable device when used stand-alone. Stand-alone management supports Telnet/SSH, HTTP/HTTPS and SNMP v1, v2C or v3.MEF 22.1 defines the standard for how Metro Ethernet service is adopted for traffic transportation in mobile backhaul applications. Mobile service is time sensitive and requires accurate packet delivery over a clocking synchronized network to transmit packetized data from a mobile device among base stations without loss. The MSW-404S supports timing synchronization features (SyncE & IEEE 1588 v2) to fulfill the IP converged services (data, voice, video) over synchronous Ethernet aware carrier Ethernet network. 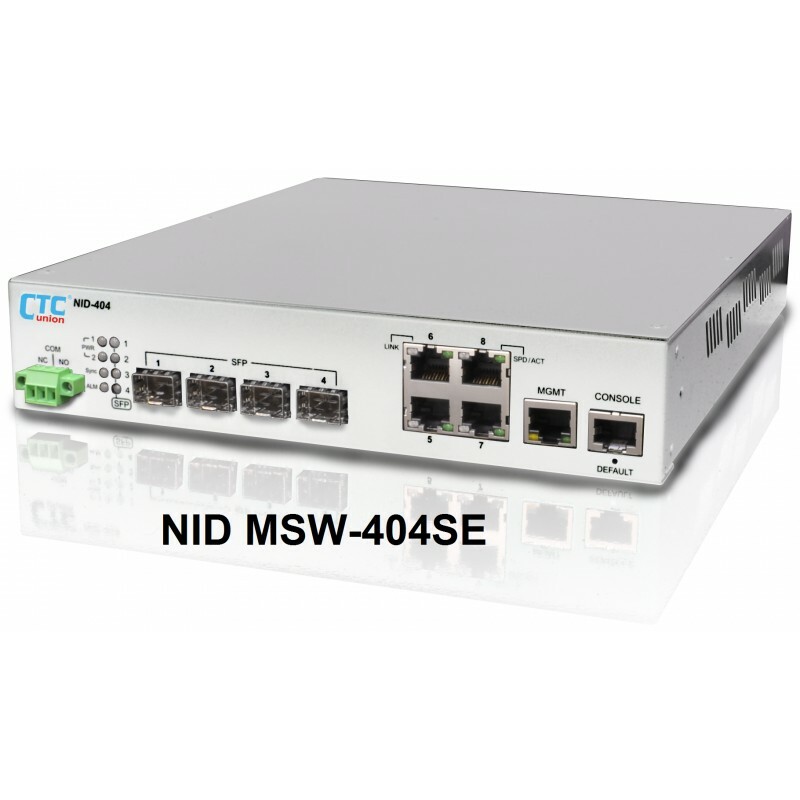 MSW-404 is a new generation of carrier grade Ethernet demarcation device for business connection and mobile backhaul transportation service delivered by carriers. 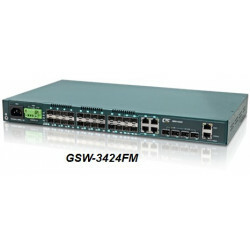 The MSW-404 is equipped 4 SFP slots as dual rate 100/1000Base-X and 4 ports 10/100/1000Base-T RJ45 network interfaces. 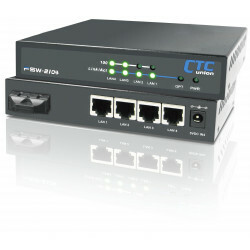 It is designed to enable E-Line, E-LAN, E-Tree services which are CE (Carrier Ethernet) 2.0 compliant for Metro Ethernet network deployments.The MSW-404 device enables carriers and service providers to delivered SLA-based network service with extensive fault detection and diagnostic capabilities which are compliant with the latest Ethernet OAM standards such as IEEE 802.3ah, IEEE 802.1ag and ITU-T Y.1731. With built-in RFC2544 and ITU-T Y.1564 feature sets, the MSW-404 also enables the service providers to perform the SLA verification anytime to ensure the quantitative latency, jitter and throughput delivery performance indexes. The CE2.0 compliant functions support EVCs and 3 colors marker QoS traffic management to enable service providers management of bandwidth and to enforce SLA guarantees. 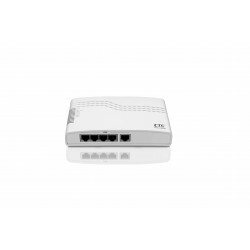 MSW-202 is a carrier class Ethernet Demarcation Device (EDD) with 2x 10/100/1000Base-T Ethernet ports and 2 x 100/1000/2500Base-X triple rate SFP fiber ports which enables EPL (Ethernet Private Line) & EVPL (Ethernet Virtual Private Line) services with advanced carrier Ethernet features per the Metro Ethernet Forum (MEF 9 and 14). 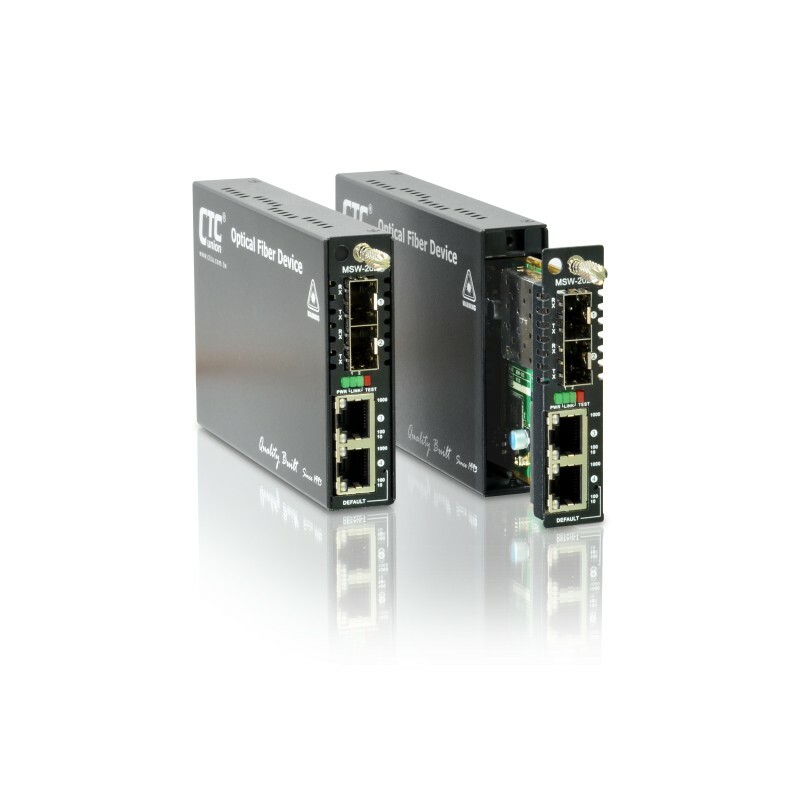 By supporting link and service Ethernet OAM schemes, the MSW-202 also provides extensive fault detection and diagnostic capabilities to ensure that actual network use complies with pre-agreed service level agreements (SLAs).